On Februrary 23rd our alert and playful Joel turned 10 years old. Although we prepared a party for Saturday, we didn´t want to miss the opportunity to celebrate him as a famiily on his actual birthday. At school, Joel gave out birthday party invitations to his friends. 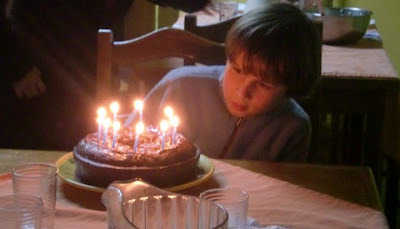 When he got home from school, we all went to wish him a happy birthday and Joel was so excited; and after dinner we were able to sing "Parabens a você," a Portuguese verseion of "Happy Birthday To You" and then the birthday boy blew out all 10 candles. His brother, Jorge, gave him a racetrack for cars, something that Joel loves. He also received a 4G pen drive, but Saturday he received even more gifts. Afterward we were able to play games where Joel was the star. It was all laughter and good times. A few weeks ago we asked Joel what he wanted for his birthday and he responded, "The presents don´t really matter so much. What I want is for all my friends to come to my birthday party." We give thanks to God for such a great family at the Dawn Refuge. Each life is a miracle.